Minelab Equinox 600 and Equinox 800 are the newest metal detectors. A metal detector is designed to find any metal items anywhere. Thanks to innovations, Equinox 600/800 adapts equally to all types of target items and soil conditions. Just select a place to search and get started! This metal detector can surely be called universal. Real intelligent multi-frequency, simultaneous use of multiple frequencies to achieve maximum performance, as well as a wide range of single frequencies available for operation. Equinox can be submerged underwater completely, it is ideal to search at the beach, in rivers, streams, and lakes (3 m). A durable and lightweight design will allow you to enjoy long search sessions in any environment. Compatible with high-speed wireless audio. Compatible with ultra fast wireless audio with WM 08 and fast aptX ™ headphones with low latency / Bluetooth. 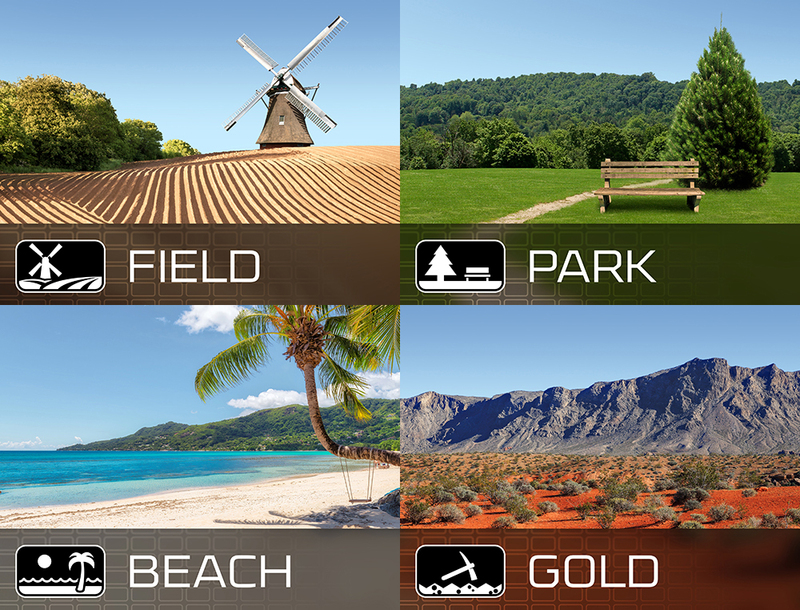 Each search mode has 2 custom search profiles, so you can save your favourite settings in each mode. Fast and accurate identification of the target. High recovery rate, coupled with accurate identification, ensures that you do not miss a valuable item in the trash. Increase control over the sound of your metal detector with additional settings; only you determine how much information about the target you will hear. This mode manages a high single frequency of 20 kHz or 40 kHz for effective search of gold nuggets in mineralized soils. Field Mode. Ideal for detecting jewelry and artefacts. The use of “Multi-IQ” in this mode will help a user to find a target with the widest range of sizes. Park Mode. Excellent performance in areas of recreation with a high content of debris. The use of “Multi-IQ” mode is the most versatile for detecting coins and jewelry. Beach Mode. Perfect if you need to search on dry sand, wet sand, or underwater. The beach mode works only in “Multi-IQ”. Gold Mode. Handy for finding gold nuggets. In this mode, high single frequency of 20 or 40 kHz the best for gold. A clear LCD display with large digits of VDI is visual and convenient, so you’ll be able to see all the information you need to search, right on the screen. Search modes and the operating frequency can be changed instantly by pressing the dynamic and continuous detection. View the charging status of your battery and wireless audio device. Create your own mask patterns of selection, to ignore unwanted targets. To change the operating frequency, mode and search sensitivity on the go. Activate “all metals” mode to temporarily disable the active mask of selection. Activate pinpoint mode to know exactly where to dig. Adjust a host of basic and advanced features including noise reduction, ground balance, volume control, threshold tone level, key tone, receive/reject, and recovery speed. Low frequencies give greater depth for larger targets, and high frequencies are usually more sensitive to smaller targets. With Equinox you can work with the full spectrum of frequencies simultaneously to achieve maximum results. 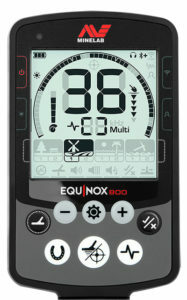 The frequency range of the Multi-IQ is shown for Equinox 600 and Equinox 800. This chart is for guidance only. The actual level of sensitivity will depend on the types and sizes of targets, soil conditions and metal detector settings. How much Minelab Equinox 600 and Equinox 800 are different from each other? Is there a big difference between them? Whether to buy a more expensive version or more simpler version is what you need? Distinguishing can be divided into two parts: different features and different equipment. Quickly switch to a custom mode program button. And the main difference is – the number of operating frequencies. USB charging cable with magnetic connector. Protective covers for a screen with inscriptions in different languages. *Equinox wireless headphones 800 wireless Module WM-08 USB Charging cable with magnetic connector. Protective cover for the screen of the user’s Guide.